Please look quickly at the picture below and write down your first thought. Don't stare at it or study it or ponder it or pore over it. Just look at it and think about what first comes to mind, then write that down. All finished? Did you write down your answer? Dr. Hortfreud will now analyze your answer and tell you what kind of gardener you are based on what you first saw when you looked at this picture. If you wrote down that you saw a crabapple branch with a garden behind it, you are a gardening geek who likes the details, the little things in a garden that make it unique. If you saw a crabapple branch but wanted to get it out of the way, you are a gardening geek who likes for everything to be in its place in the garden. If you saw a crabapple branch but worried that it might poke someone in the eye or slap them in the face as they entered the garden you are a gardening geek who worries too much, who takes the safe route in gardening. If you saw a garden and just now noticed the crabapple branch, you are a gardening geek who is interested mostly in the entire effect a garden has on a person. You like to leave details to others. If you saw both a crabapple branch and a garden, then you are a gardening geek who probably thought too much about the picture and are also likely to over analyze your own garden. If you saw the crabapple branch and wondered if it was really a crabapple branch, and if so what kind, then you are a gardening geek who probably labels the plants in her garden, or at least keeps track of all the plants in her garden. Finally, If you saw anything else in the picture related to gardening, you are a gardening geek, plain and simple. So how did you do on The Crabapple Branch Gardener's Personality Test? "Oh - there's a crabapple branch ready to bloom in some rich person's garden... wrought iron is so darned expensive... but why are the flowers all coming out on the top? Didn't our old tree in IL have flowers all around the branches?" Well, Dr Carol? Think it's just a gardener who needs 1 more hour of sleep? I am still geeking right along. I saw the branch but was wondering about the stone stacked up in the background. I saw the branch first, detail oriented of course, also wondered what kind it was, do try to keep track of what is growing in a garden. Was there a background? 'Spring' is the first thought that came to mind. 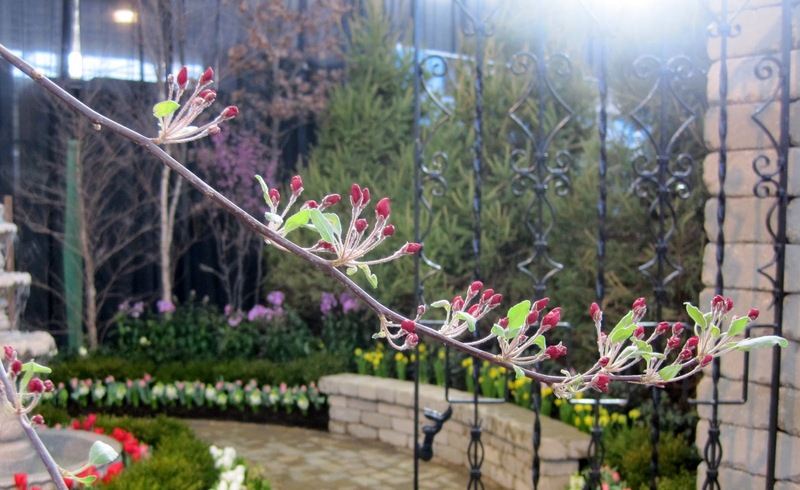 Then Spring Flower Show of course. Hope it was a good one. I thought "fuzzy" because the photo is small and it has a blurry background but the subject isn't as clear to me as it should. I find myself squinting at it. Personality? I'm a photo snob...lol. I just wondered what variety of crab it was! I noticed the contrast between the red of the buds and the chartreusey-green of the branch and how well distributed the bud clusters were. I also admired the way the light was hitting it. I never considered what kind it is and vaguely noticed the background. What does that make me? I took a look at the branch and thought, how pretty" than my eyes fell on the yellow tulips/flowers and stone setting in the background. Lovely was my first thought. I didn't see the garden behind it until my third thought. "Pretty" was all I thought. Must be I'm simple minded? Of course, that was just the first thing that came to mind. If you had said write down everything that comes to your mind, and not just the first thing, well, I could have written a lot more. Must be I'm a literal minded gardening geek. And what a great photo to set as my desktop background. Done and done. Buds. I saw buds. It is the time of year to look for buds. I thought: "Look at those tiny little buds. They'll open up any day now." I honestly did not see the garden in the back till I started reading!! Hahaha. My immediate reaction was to reach for my pruner to remove the offending branch. Perhaps this response is conditioned by the fact that my neighbor has a large apple tree that overhangs my fence and I am always trimming back his branches. Every year I am crazy jealous over your snowdrops!!! 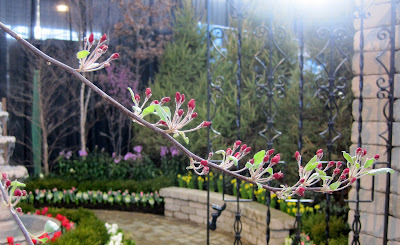 My first thought: How gracefully curved the branch is and so pretty holding the leaves and buds upright. Second: Wonderful colors. I love pink and that soft green! Third: What a beautiful photo.